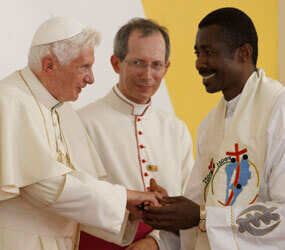 VATICAN CITY – Pope Benedict XVI is making his second trip as pope to Africa, spending three days in Benin and presenting an important document on the future of the church on the continent. VATICAN CITY – A Catholic movement based in France has acknowledged with “humility and repentance” that acts of sexual abuse were committed by its founder and other important members of the organization. When Rosibel Mancillas Lopez meets undocumented immigrants living in the shadows of mainstream U.S. culture, she goes into action. 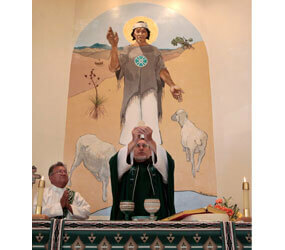 GALLUP, N.M. – To visit the Gallup Diocese is to fall in love with its vibrant culture, rich history and rugged beauty – rose-hued mesas, deserts of sagebrush and cactus, and forested mountains – but most of all with its people. VATICAN CITY – The unusual and somewhat mysterious gestation process of Vatican documents came into the spotlight recently, thanks to a controversial white paper on economic justice. 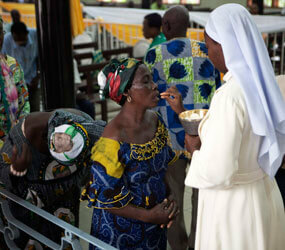 COTONOU, Benin – Arriving in Benin for a three-day visit, Pope Benedict XVI urged the African continent to protect its ancient values in the face of spiritual and ethical erosion. 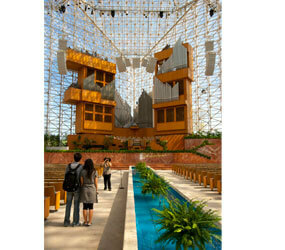 ORANGE, Calif. – A bankruptcy court judge has ordered the sale of the Crystal Cathedral and its nearly 31-acre campus in Garden Grove to the Catholic Diocese of Orange for $57.5 million. Four Archdiocese of Baltimore young people, who were highlighted in one of my posts last night through an audio interview, were on stage as animators for NCYC. Here they are in action, leading everyone in prayer, song and dance.